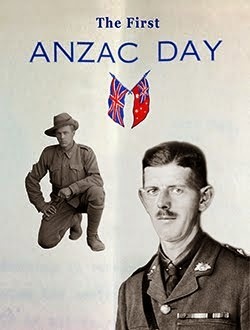 The First Anzac Day was held in Adelaide on 13 October 1915 replacing the traditional Eight Hour Day holiday for one year only. A long procession was the central commemorative activity of the day. The procession was lead by the Naval Brigade followed by wounded veterans home from Gallipoli and Egypt and nearly 5000 new AIF recruits. After the march concluded people gathered at Adelaide Oval for sports and entertainment. 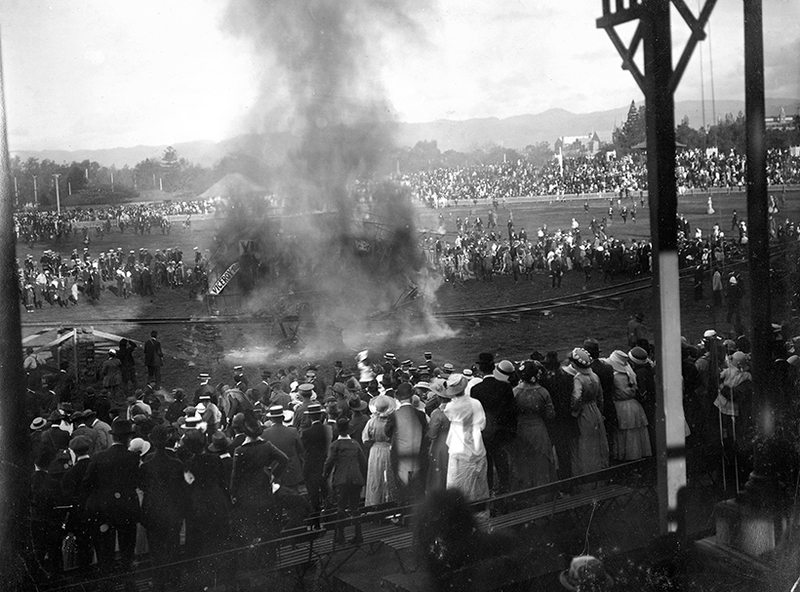 The main focus of the day was raising funds for the wounded soldiers and in an effort to attract a large crowd to the oval The Great Tramway Smash had been promoted in the newspapers as "the biggest sensation ever seen in Adelaide". The crowd in attendance was estimated to be 20,000. From the Advertiser 14 October 1915 "Extensive arrangements were made to arrange the smash - a real American novelty. When it was proposed the general manager of the Tramways Trust (Mr. W. G. T. Goodman) offered to assist in the matter. 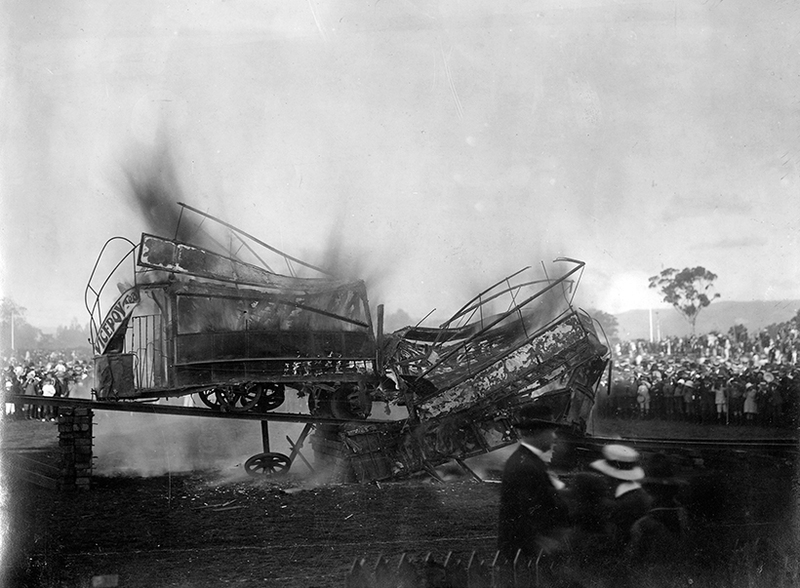 Two obsolete horse tramcars were hooked at either end on platforms about 30 ft. high. The track over which they were to speed dipped from each platform, and was almost level with the ground in the middle. Thousands of eyes were strained on the cars as they were started on their last run. As each second passed the cars gathered more speed. The huge crowd waited in suppressed excitement, as the cars bolted towards each other at a speed of about 16 miles per hour. The effect of the collision was startling. Explosions of detonators placed on the rails added to the din. The cars burst into flames immediately the impact took place, this having previously been arranged for. Fifteen thousand people were thrilled by an incident rarely seen. Extensive damage was done when the cars were piled against each other. Nearly eight tons of wood and iron were involved in the collision. To the ordinary eyewitness it was like watching two tramcars melt into a shapeless mass of twisted iron and splintered wood. The flames completed the total destruction of the cars." Photographs from South Australian State Library collection.